Everything seems lovelier by candlelight. Candles can add warmth, style and ambiance to any room in the home. Candlelight can transform the garden or patio into one of your home's most enchanting areas. Bring a shimmer of candlelight to your patio dining with this beautiful candle globe. 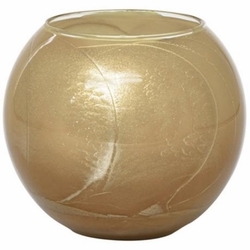 This alluring candle globe comes in an alluring khaki color and comes in a lovely glass holder. Mysteria scent is released when lit and you and your guests will enjoy hours of scented candlelight that is unparalled. • Wax is carefully hand poured. • Holds 7 ounces of wax. • Releases mysteria scent when lit. • Burns up to 50 hours. • Packaged in a black silk gift box.